For me Azrael has always been the Angel of Death, I hear that name and I think of scythes, cloaks and heading towards a bright white light. So I was intrigued by Cafe Azrael and its taped up smiley cat. The only reference I can find that might explain the connection is that in The Smurfs, Gargamel's incompetent cat was called Azrael. However, with no sign of little blue people and only a generic cat shape to look at, I'm not quite sure whether Smurf fans would make the connection. 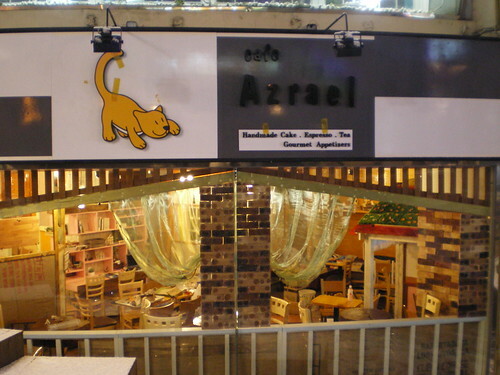 Cafe Azrael is located in the back streets near Ewha Women's University, but judging from the tape on the sign and the mess in the cafe itself, I wouldn't recommend it.